We ran into Ryan on the internet and since MC is a recovering drummer, this custom spoke to us. We asked Ryan about his custom. 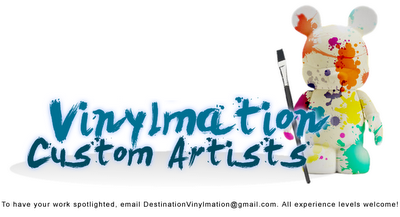 Destination Vinylmation: Hi Ryan, how long have your been doing customs? 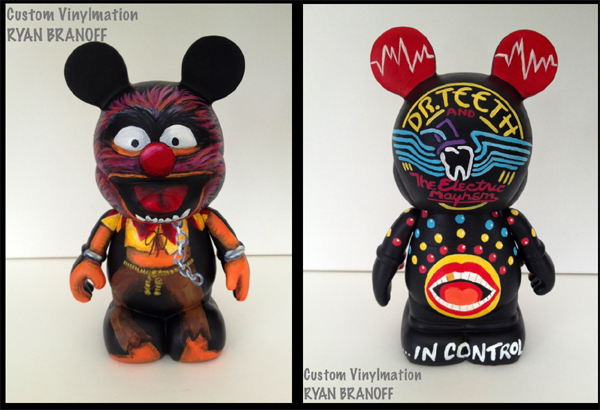 Ryan Branoff: I’ve always been interested in the custom world of Vinylmation. 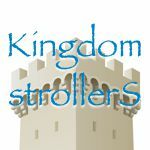 I have been collecting Vinylmation for the last 3 years, but have just recently in the past month been doing my own customs. I’ve been working really hard this past month, I never knew how addicting creating your own Vinylmation would be! DV: They are addicting! So, what is your art background? RB: Art has always been a major part of my life. I went to an arts-centric high school, where I studied Visual Arts, and this continued on to university. Since then, I have been working as a commission artist with a focus on portraiture (on the side to my day job). DV: That sounds fun. I love this figure, what inspired it? RB: Definitely my love of the Muppets was the inspiration behind this figure. Ever since I was little, I have been a big fan of the Muppets, especially Animal. 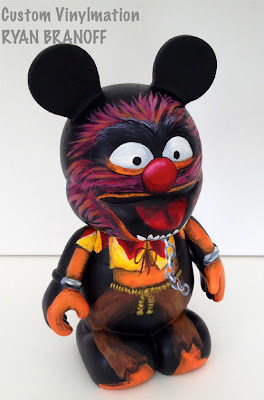 I have a pretty expansive Muppet collection spanning from the Palisades line of action figures to every Muppet-related Vinylmation that has been released. I knew my first 9 inch custom had to be special, and the result was my Electric Mayhem Animal. DV: What was the most difficult part of this design? RB: The Electric Mayhem logo on the back was the most challenging. I knew I had to get it just right to execute the overall design on the back of figure and in order for the figure to have the overall feel I was going for. DV: Don’t worry. It looks great! Just curious, which are your favorite Muppets? RB: Animal, Gonzo, and Bean Bunny. 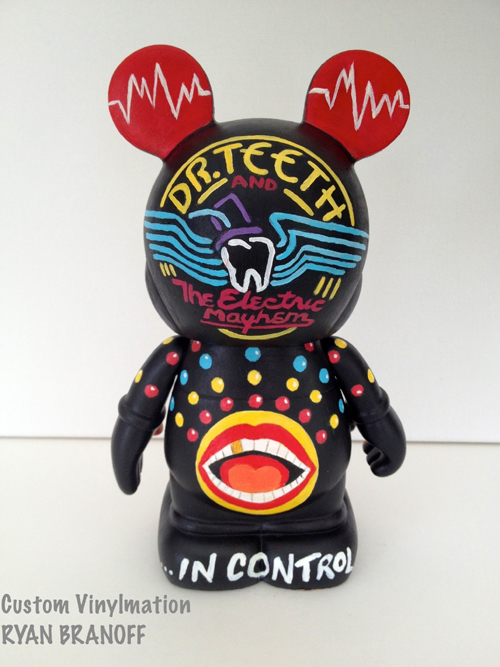 DV: Which of Disney’s VInylmation figures is your favorite? RB: This one is really tough. There are a lot of figures that appeal to me, but I would have to say that it’s a toss up between Park 1 Kermit and Park 3 Rizzomouse. DV: How can people find more of your figures? RB: To see any of my past projects and for future releases, you just need to ‘Like’ my Facebook Artist Page: www.facebook.com/CustomVinylmationRyanBranoff or email me at [email protected]. VIDEO: Big Thunder Mountain Interactive Queue Soft-Opens!